Alter The Press! : Tegan and Sara Hinting 'So Jealous' 10-Year Anniversary Tour? 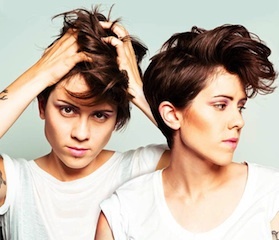 Tegan and Sara Hinting 'So Jealous' 10-Year Anniversary Tour? It looks like Tegan and Sara are (possibly) hinting news of a potential ten year anniversary tour to commemorate the release their So Jealous album. The Canadian indie-pop duo posted lyrics from the track "I Won't Be Left" earlier today on their Twitter account with '#sojealous10' attached. Could this be the Quin sisters way of teasing fans with the possibility of a tenth anniversary tour of their So Jealous record? This is pure speculation on our part..but we can dream, right? Tegan and Sara's So Jealous album was released on September 14th, 2004.